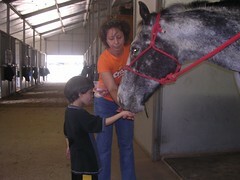 Moomin and my mom feeding Cactus, a horse in the Houston stables where my parents take riding lessons. I know how nervous he must have been to feed this huge strange horse. Their mouths are slobbery and scary especially when you’re small and looking up at the huge yellow teeth.